BACKGROUND AND PURPOSE: No consensus exists regarding pain management during PV. In this study, we evaluated the effectiveness of local infiltration anesthesia as the only pain medication. MATERIALS AND METHODS: From September 2008 to March 2009, 44 consecutive patients (35 women and 9 men; mean age, 74 years) with symptomatic OVCFs were included in the study. Lidocaine was infiltrated to the skin and the periosteum of the pedicle. After PV, patients indicated pain sensation on a VAS. In addition, patients indicated the most painful moment during the procedure: lidocaine infiltration, placing the needles, or cement injection. Finally, patients were asked whether pain medication during the procedure was sufficient. After the procedure the surgeon was asked to judge the expected VAS score of the patient. RESULTS: Mean VAS score was 5.7 (median, 6; range, 1–10). Seventeen of 44 patients (39%) indicated that lidocaine infiltration was insufficient for procedural pain reduction. The mean VAS score of these patients was 7.3 (range, 5–10). Placing the needles was specified as most painful moment in 29 patients (66%), lidocaine infiltration in 11 (25%), and cement injection in 4 (9%). Surgeons' expectations of patients' VAS scores were a mean of 3.3 (median, 3; range, 1–6). CONCLUSIONS: For a substantial proportion of patients, local infiltration anesthesia was not sufficient for pain reduction during PV. The severity of pain experienced by the patient is usually not appreciated correctly by the surgeon. Pain management during PV is subject to variation among surgeons, from local infiltration anesthesia to general anesthesia supplied in the operating room. In a recent study,2 a protocol of titrated intravenous sedation with fentanyl and propofol, local infiltration anesthesia, and monitoring of vital parameters resulted in good tolerance for the procedure. Since the introduction of PV for OVCFs in our hospital in 2001, we have used local infiltration anesthesia as the only pain medication. In our experience, most patients seem to tolerate the procedure rather well, and only in a minority of patients is additional intravenous fentanyl requested. To objectify our assumption of patients' tolerance of the procedure, we quantified patients' subjective pain sensations during PV with our standard pain-management protocol. This prospective study was approved by the institutional review board, and patient informed consent was obtained. From September 2008 to March 2009, 44 consecutive patients with OVCFs were included in the study. There were 35 women and 9 men with a mean age of 74 years (median, 75 years; range, 45–89 years). One day before PV, patients were informed about the procedure by the attending radiology resident on the ward. During this consultation, the possibility of asking for additional pain medication during the procedure was emphasized. PVs were performed by 1 of 2 experienced radiologists on a biplane angiographic system (Integris BN 3000 Neuro; Philips Healthcare, Best, the Netherlands). Ten mL of lidocaine 1% (B. Braun, Melsungen, Germany) was infiltrated from the skin to the periosteum of the targeted vertebral pedicles. Oxygen saturation and electrocardiogram were monitored by pulse oximetry. Via a bilateral transpedicular approach using 11- or 13-gauge needles, bone cement was alternating injected under continuous fluoroscopy by using 1.0-mL syringes. During the procedure, patients were informed about the progress with notification of local infiltration anesthesia, needle placement, and cement injection. Immediately after the procedure patients filled out a questionnaire to indicate pain sensation on a VAS, ranging from 0 (no pain) to 10 (worst pain ever).3 In addition, patients were asked to specify the most painful moment during the procedure as lidocaine infiltration, placing the needles, or cement injection. Finally, patients were asked whether pain medication during the procedure was sufficient. After the procedure, the surgeon was asked to estimate the patient's expected VAS score. 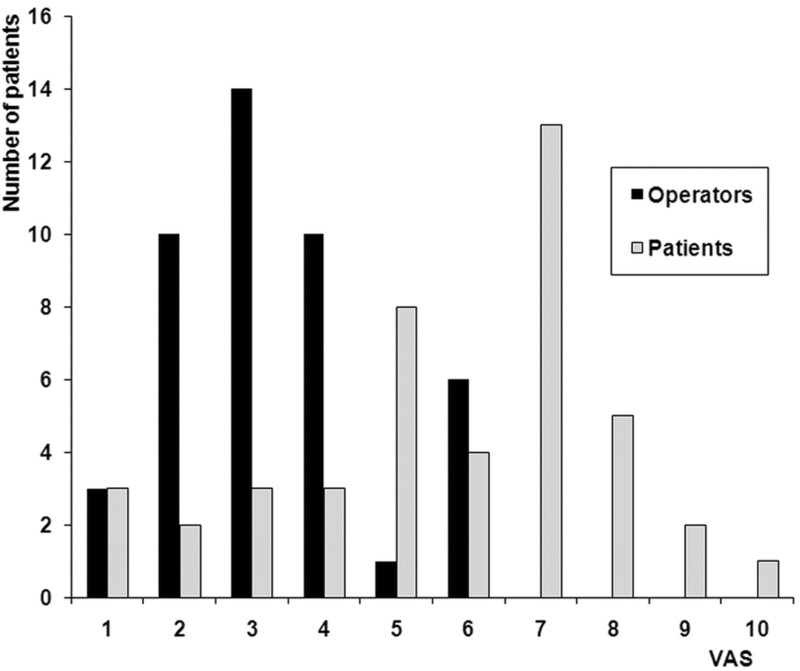 Patients' VAS scores and surgeons' expectation of patients' VAS scores are displayed in Fig 1. Mean patient VAS score was 5.7 (median, 6; range, 1–10). Seventeen patients (39%) indicated that lidocaine infiltration was insufficient. These 17 patients had a mean VAS score of 7.3 (range, 5–10). For 27 patients (61%), lidocaine infiltration was sufficient. These patients had a mean VAS score of 4.7 (range, 1–8). Patients' VAS and surgeons' expectation of patients' VAS in 44 patients during PV. The most painful moment was placement of the needles in 29 patients (66%), lidocaine infiltration in 11 patients (25%), and cement injection in 4 patients (9%). None of the patients requested additional medication. In the performance of PV, the use of infiltration anesthesia as the only pain medication is usually not sufficient to make the procedure tolerable from the perspective of the patient: Three-quarters of patients indicated a VAS score of ≥5. Despite this high VAS score, patients did not request additional medication during the procedure. The surgeons who performed the PVs did not have the impression that pain was apparently unbearable; in many cases, they were surprised by the patients' high VAS scores after the procedure. Apparently, there is a discrepancy between pain as perceived by the patient and the impression of pain perception by the surgeon. Pain management during PV is subject to variation among surgeons and varies from local infiltration anesthesia to general anesthesia in the operating room. Until now, 2 authors2,5 concentrated on this subject. In a study of 20 patients,2 a protocol of fentanyl and titrated intravenous propofol allowed a pain-free procedure. No adverse advents were registered. Such a protocol might meet the criteria of a targeted analgosedative procedure that ensures comfort during PV without, as with general anesthesia, the need for longer hospitalization. There was a remarkable discrepancy between the patients' VAS scores and the expectations of the surgeons, with far more pain experienced by the patients than expected by the surgeons. We believe the patients' relatively high mean VAS scores in this study are a good representative of the experienced pain during PV, and the surgeons' impressions of pain experienced by the patients are of little importance. The results of this study have made us realize that lidocaine infiltration only is, for most patients, not sufficient for pain reduction during the procedure. We adjusted our pain medication protocol and now administer fentanyl in all patients. For a substantial proportion of patients, local anesthesia was not sufficient for pain reduction during PV. The severity of pain experienced by the patient is usually not evaluated correctly by the surgeon. Accepted after revision September 30, 2009.